Everyone has them. They can be as simple as tiny spots that seem to show up against the background of a clear blue sky, or as maddening as the large threads that are impossible to look directly at and just as impossible to ignore! 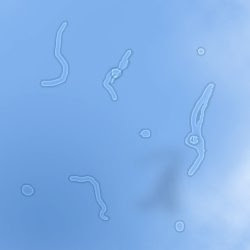 They’re called floaters, and chances are you’ve seen yours. I'm not talking about digestion (floaters vs. sinkers). These are the spot-like, thread-like, or web-like debris that float in the gel between the lens and the retina of your eyeball. While most people can get through life with no, or minimal annoyance from these little doodads, some have complained of severe symptoms caused by the constant perception of floaters in their field of vision. Distraction and difficulty concentrating during such tasks as reading, watching television, walking outdoors, and driving have been reported. I recently discovered that I have a floater resembling the shape of a question mark. I've been looking at it all these years - no wonder I'm so confused! As Christians, we used to be in darkness. Now, God has brought us into the kingdom of light. We can sing, “I once was blind, but now I see.” But how well do we see? When we look at Jesus do we see him alone, in all his majesty, and glory, or are we being distracted by all those other little things in our field of vision? We can easily fall prey to floaters. We’re not troubled by blindness anymore. We can see Jesus, but we lack clarity. We’re like the blind man Jesus touched, who said, “I see people; they look like trees walking around” (Mark 8:23-25). In such cases we may need another touch! Do you see Jesus, plus all those little bothersomes of life?, Do you feel like your eyes are being confused by the marginal debris and it keeps pulling you away from the focal point? Sure you're saved. Sure you're on our way to heaven, but are those little tasks, attitudes, sins and schedules distracting you from reaching your full potential? Ask God to touch your eyes, so you can see him more clearly. Think about what "floaters" are in your line of sight. Wondering where’s your sense of purpose? Wondering why the lack of focus? Wondering how you could be so distracted? Maybe it's those floaters!